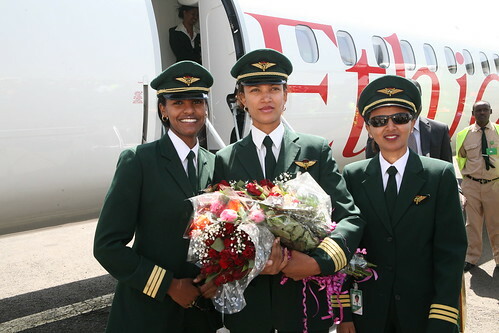 The following are pictures of Captain Amsale Gualu Endegnanew at Bole International Airport, provided by Ethiopian Airlines to nazret.com. 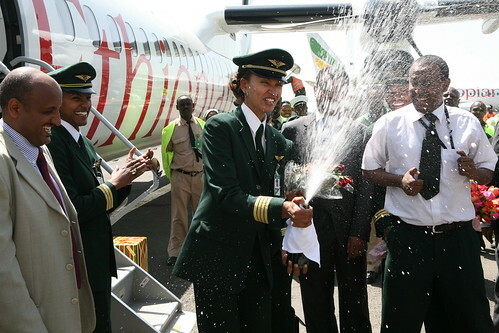 Ethiopian Airlines today celebrated the maiden flight of its female Captain Amsale Gualu Endegnanew. 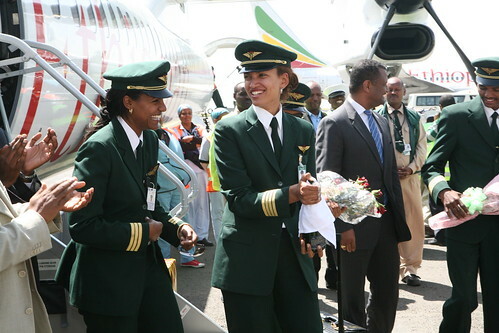 Captain Amsale proudly took off her first flight from the left hand seat of the flight deck of a Q-400 aircraft from Addis Ababa to Gondar then to Axum and finally returned back to Addis Ababa after a total of 3.6 flight hours. 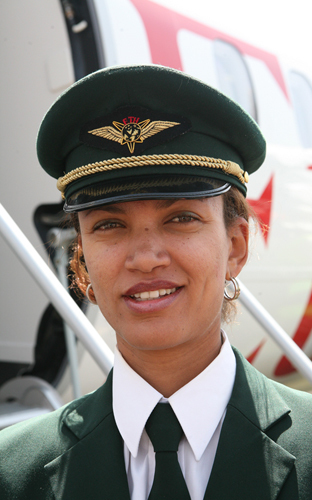 Captain Amsale joined Ethiopian Airlines Pilot Training School on July 10, 2000 and started her career as first officer on November 26, 2002. Since then, she has trained and worked on Fokker-50, 757 and 767 aircraft as first officer. Captain Amsale has been able to complete successfully all the necessary training requirements and passed through rigorous checks to gain her four stripes. She has a total of 4475 flight hours under her belt when she becomes the commander-in-chief of her flight. This entry was posted on October 16th, 2010 at 22:11 by apache and is filed under Ethiopia.